I purchased the couching feet when they first came out and had done a bit of experimenting with them. But I didn’t feel very confident using them and had a few issues with starting and ending, and with the thread skipping the yarn. So I invested in learning the proper way to use these feet from the designer of them — and had a ball of fun doing so! I was in the second-ever class in the world that Helen has run on this technique (the first class was the two days prior), and so it was a learning experience for us all — Helen got lots of examples of how we all interpreted the same pattern she provided, and we got the benefit of her knowledge and artistic flair. 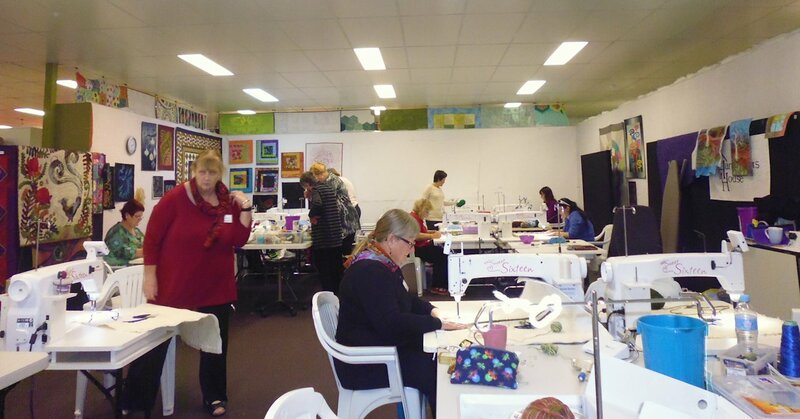 There were 16 ladies in the class (14 on their Sweet Sixteens, the same machine I have) held at Handcrafters House, and all were very generous in sharing their yarns. 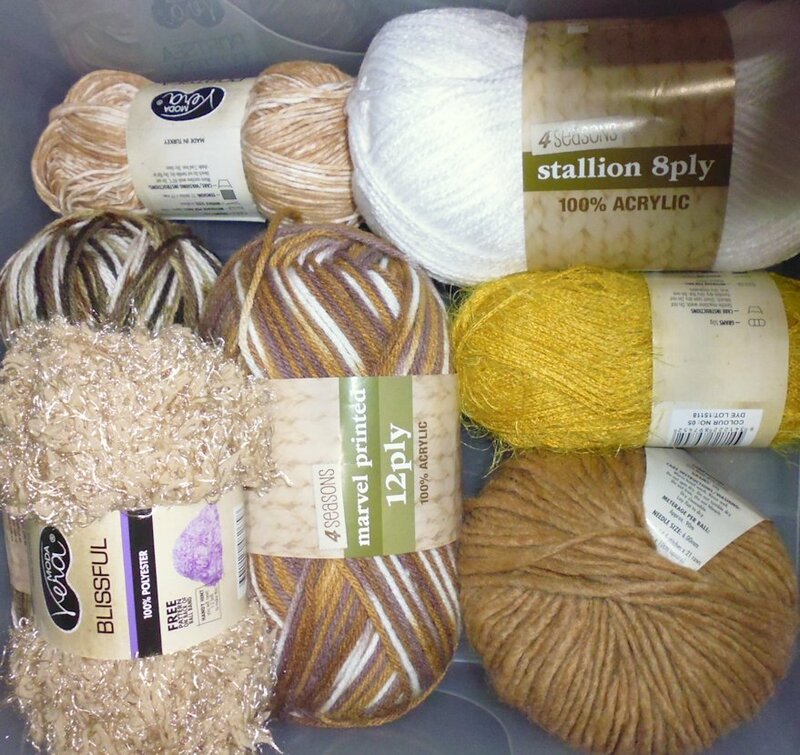 My yarn stash was pretty small as I don’t knit or crochet, but I was able to supplement my meager supplies with yarns from others. 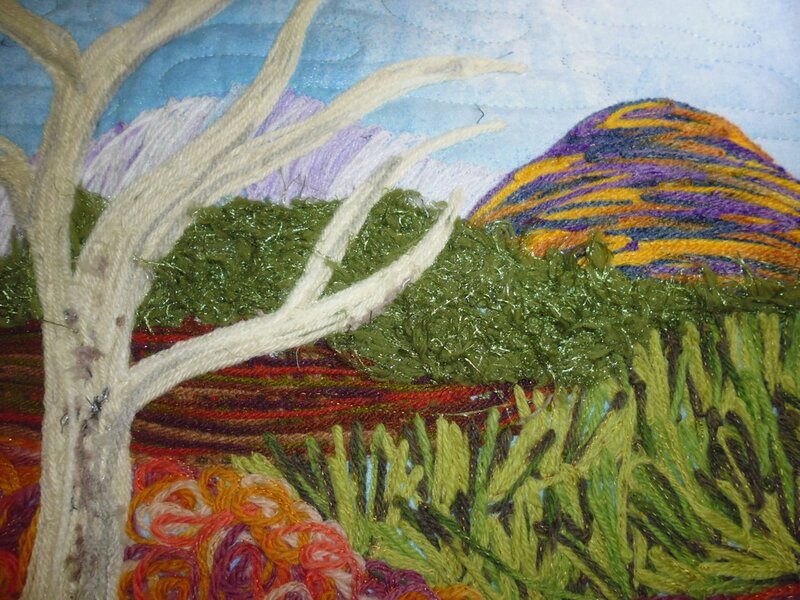 The technique is basically thread painting, but with yarn instead of thread. As I’ve done a lot of thread painting, I was comfortable with that side of it. It was the hints and tips and ‘best practice’ stuff I was there for. And we got plenty of that! 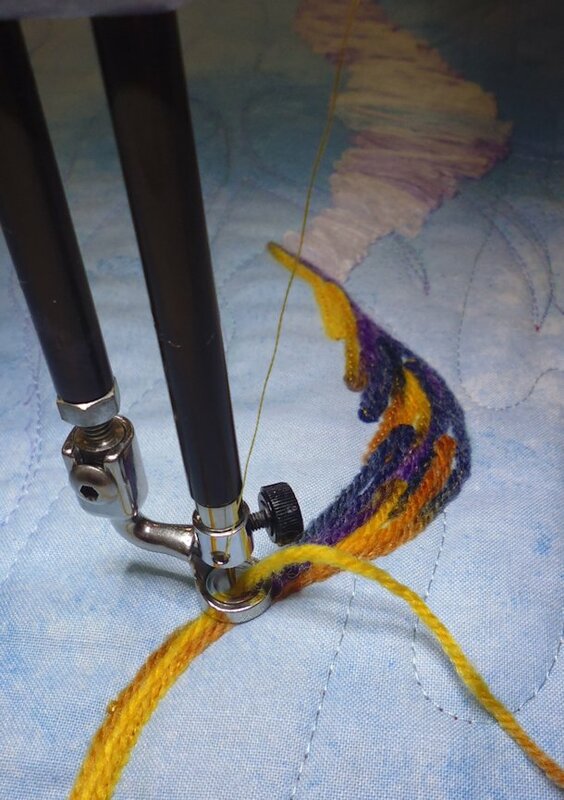 Helen will be releasing an online class soon on this technique (including patterns), and I highly recommend it if you have the Handi Quilter couching feet but aren’t sure what to do with them or how to use them. 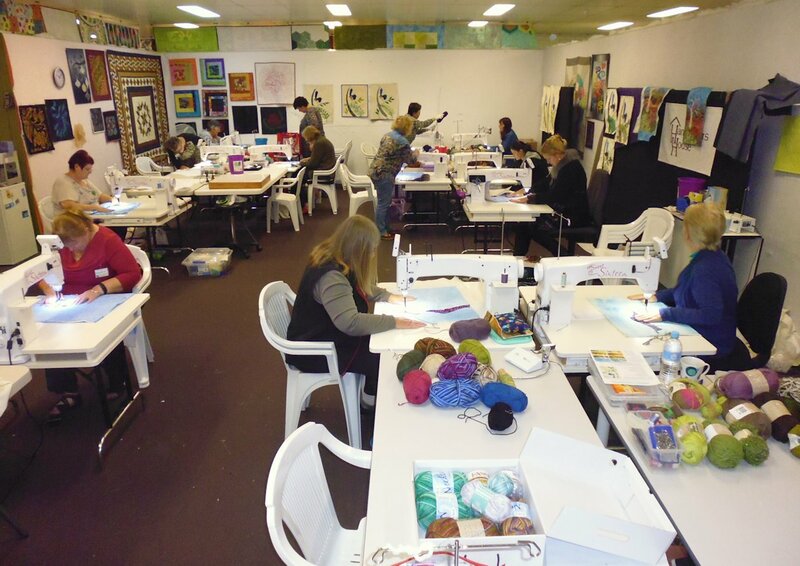 On Day 1 Helen showed us the basics and we did just enough practice to feel comfortable before yarn couching the blue wren pattern Helen gave us. The day after the course finished, I went to my local Spotlight and stocked up on yarn — fortunately they had a 40% off all yarns sale on at the time, so I was able to make good use of the dollars I spent. Maybe I’ll get to use them now that I have lots of ideas and inspiration from Helen! I’m hooked! The pattern markings were done with a Frixion pen, which magically irons out; the beak, eye, and legs were done with a Sharpie; everything else about the bird and the leaves was couched yarn; the background was quilted prior to couching the bird and leaves. For the long flat leaf, I used a knobbly variegated earthy green yarn — I really liked the effect, but I think it was a bit heavy for the pattern. 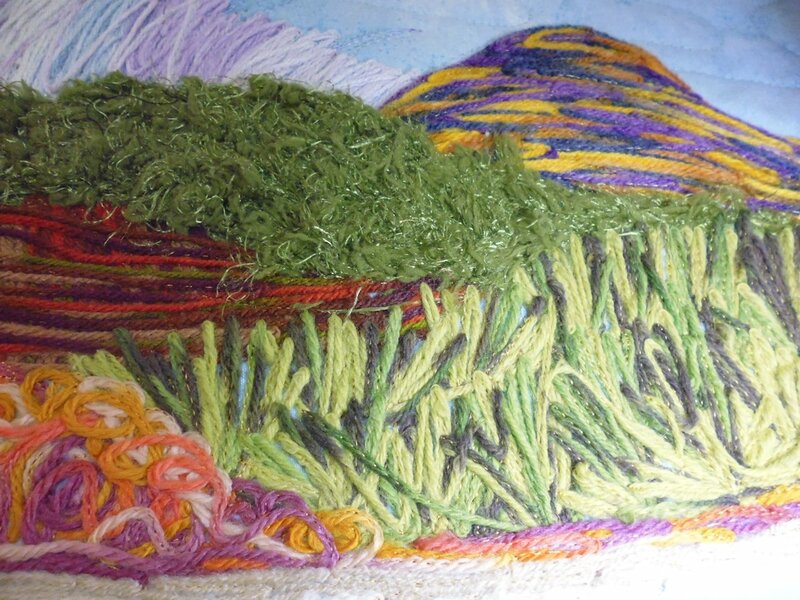 I could see myself using this sort of yarn in a forest or jungle background scene, or for reeds or rushes in a foreground. If you look closely, you can see the thread I used to secure the yarn to the quilt top. I LOVE the yarn I used for the fern — it was soft and fluffy and had a cream core, which stitched out as veins in the fern leaves. 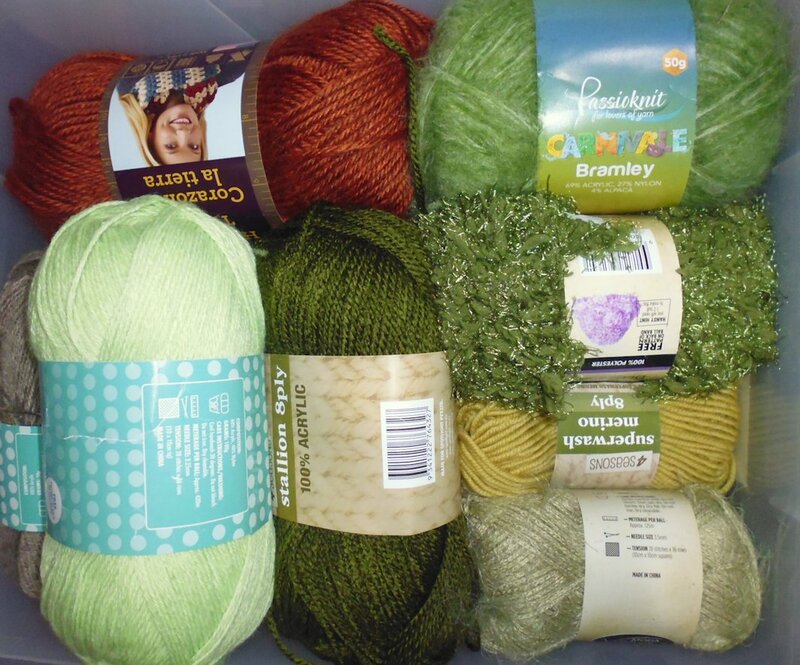 I found some of this yarn at Spotlight, so have now purchased my own ball of it! 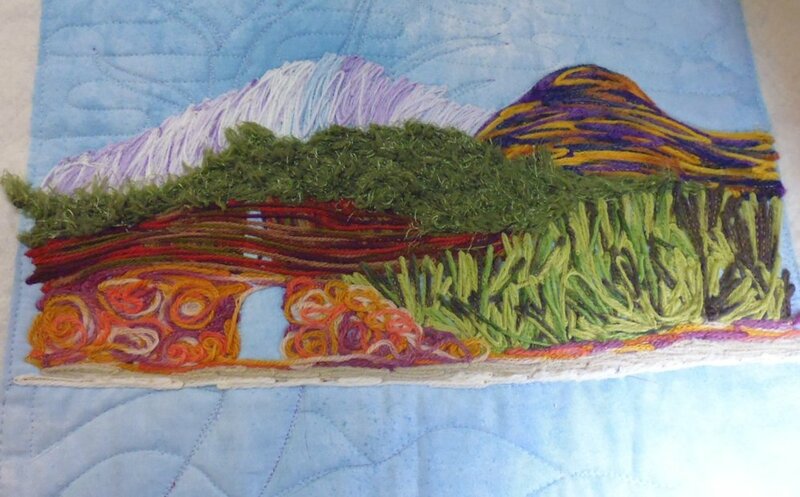 After tracing the pattern onto our sky fabric, creating our quilt sandwich, and stitching down the main elements of the apttern to stabilise it, we started couching the elements furthest away — the hills in the background. I used a variegated 4-ply baby-soft yarn in creams, soft blues, and mauves for the snowy mountain range. 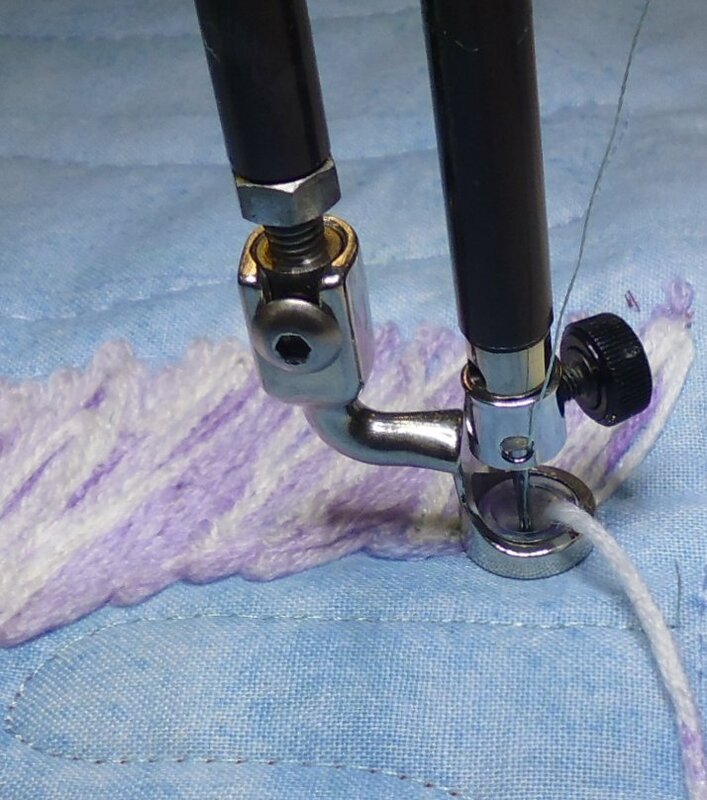 The close-up of the needle shows the special plastic surround of the couching foot and the hole that the needle, thread, and yarn go through. 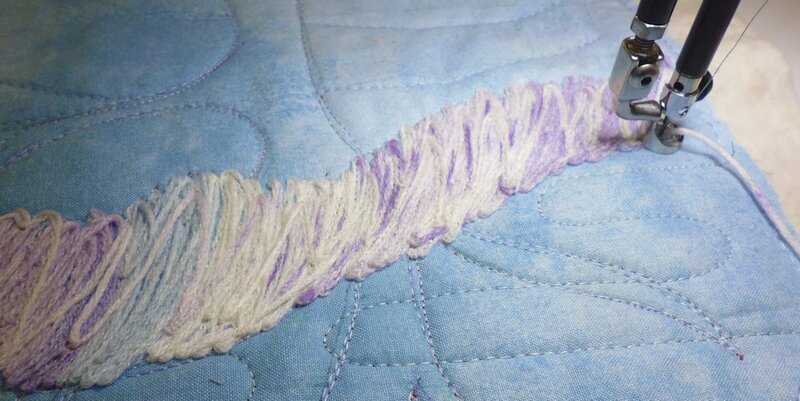 I stitched the front hills with a variegated 8-ply purple, blue, orange, brown, and yellow yarn. Helen thought they looked like The Bungle Bungles (Purnululu)! 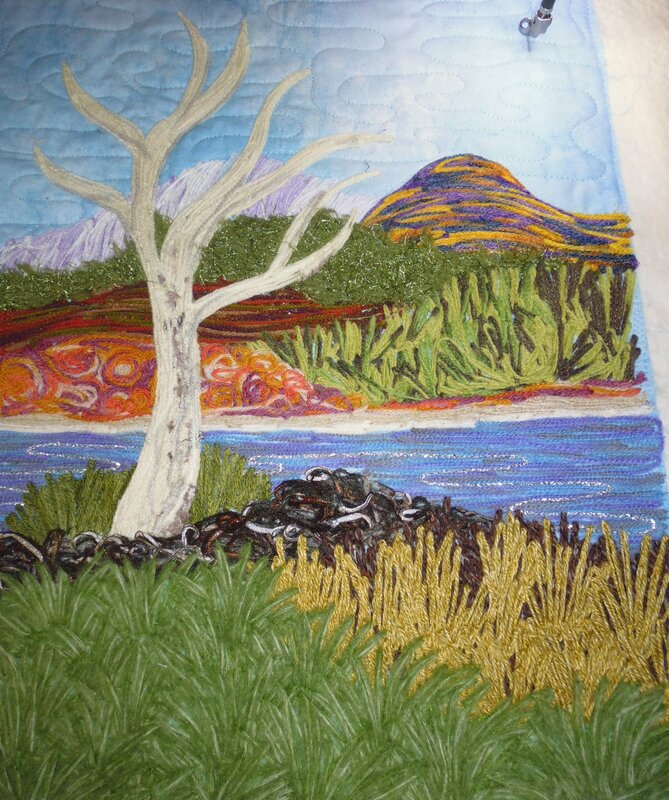 After adding the water, the reeds behind the tree, and the tree, I stitched the foreground elements. I was REALLY pleased with the effect for the plants right in the foreground — I used the same soft furry green yarn I’d used for the fern on the wren piece. Again, the cream core of the yarn showed through as veins on the leaves. LOVE that yarn! 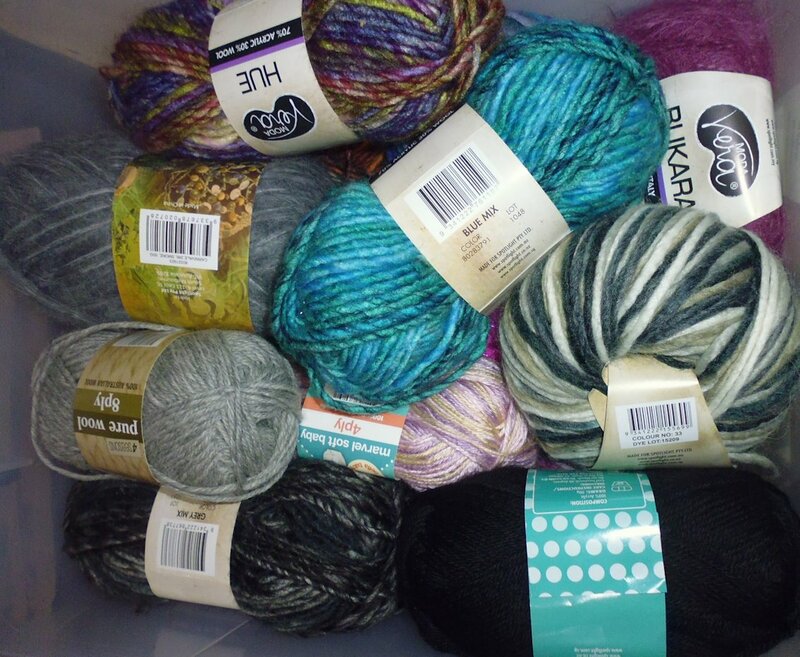 My new stash — yarn! 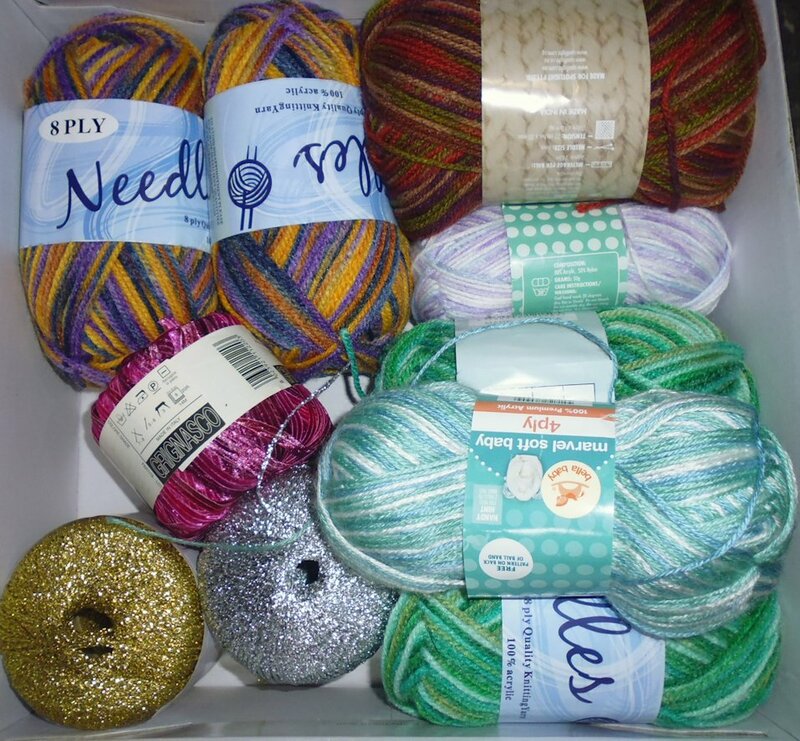 This was my previous yarn ‘stash’ – 8 balls of yarn, 2 of metallic, and one ribbon yarn…. Awesome and inspiring! The couching foot/technique hasn’t made its way to my place….yet! 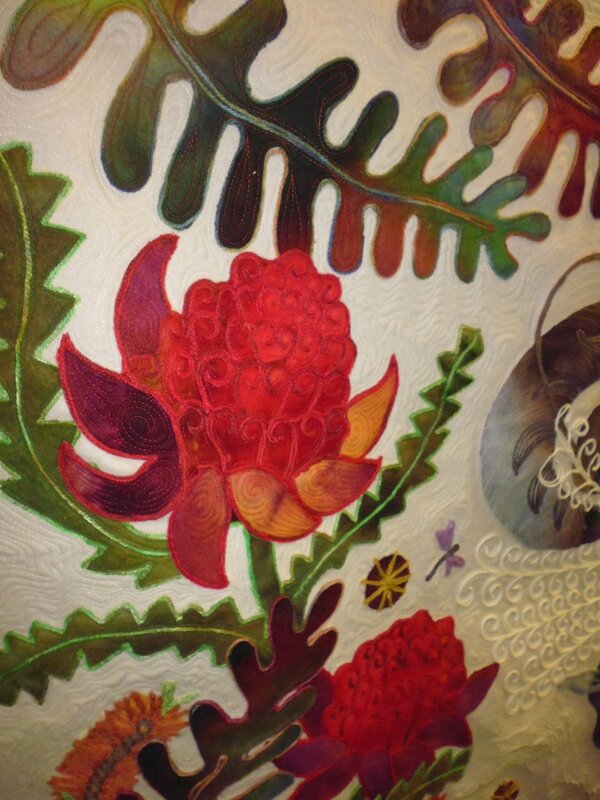 Karlee Porter (Graffiti Quilting) uses it constantly with such interesting results. Tempting!!! Your pieces are beautiful!!!! 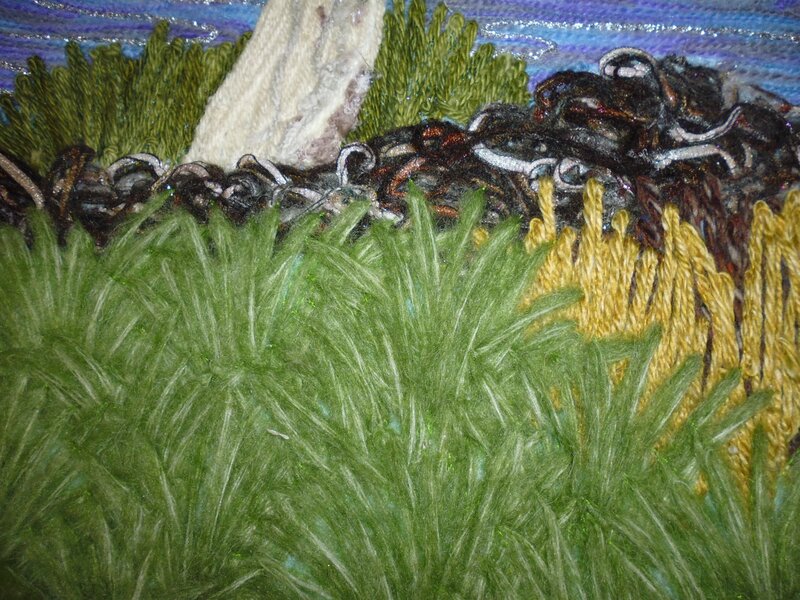 In the closeup shots of your landscape piece, the textures you achieved using the various yarns are just ah-mazing! I love your threadpainting anyways (duh!) because of the precision you get. 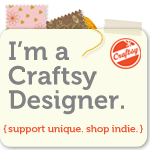 But to use the different types of yarns to get textures? It opened up a whole new world, didn’t it? 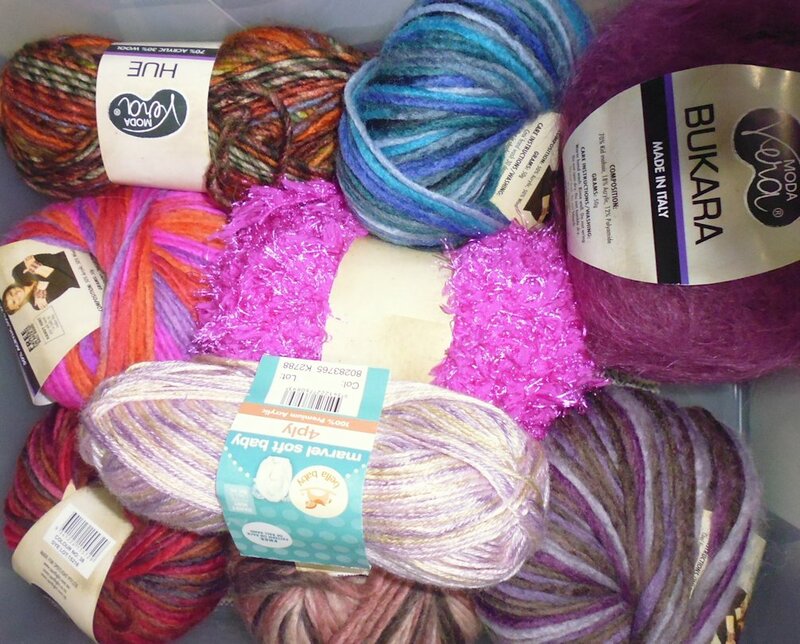 I get the feeling you were like a kid in a candy shop, buying up your stash of yarns! This is something you can do on your machine(s) at home, yes? So very pretty, Rhonda! And so very creative!!! Wowza Wowza. That technique would make beautiful pillows. I didn’t realize that Helen was the original person who got the couching foot to Handiquilter. I have couching feet for threads for my DMS. I wonder if she was the “push” to get the original foot to convert to the ankle feet. I’m sure that was a money maker for HQ.